After the stage greet of her movie 'Shirayuki Hime Satsujin Jiken', Inoue Mao went back to her home in a quiet residential area in Tokyo where she lives with her parents. Three hours later, at about half past 10, Inoue Mao, clad in a hat, mask and glasses left again. Looking about around her, she got into a taxi. A few minutes later, she got off. It seems like she had abruptly received a call. Maybe she was looking for her destination, but as she looked at her phone, she was walking this way and that. She finally ended up at an exclusive yakiniku restaurant that came with private rooms. It was close to time for last orders, but she went in without hesitation. 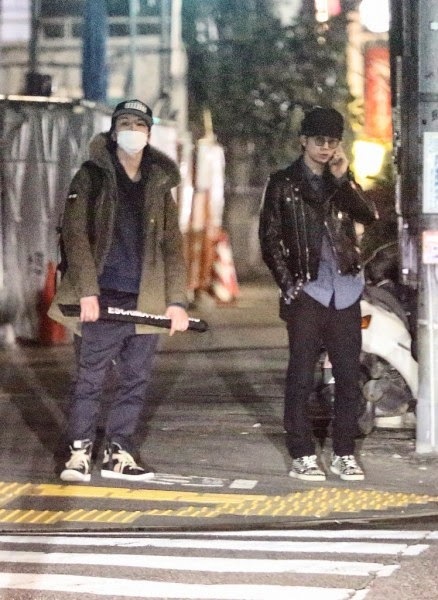 There was a reason for her to be vigilant although she was out late at night with hardly anyone around and this was because it was none other than Matsumoto Jun that was waiting for her inside. At 2 am, it was two hours past closing time and the entrance was already locked for the night. The lights were already switched off. From the exit used by staff, out came Inoue Mao. Beckoned by an employee who was keeping a lookout, she got into a taxi by herself and headed home. 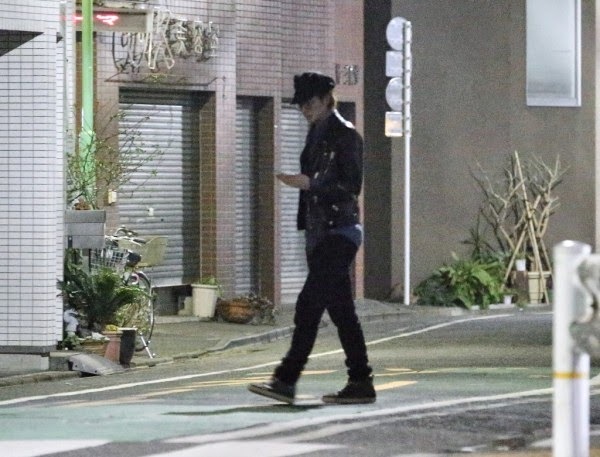 Five minutes later, out came Matsujun in sunglasses. With him was Ikuta Toma. Likewise, they got into a taxi and headed to residential areas. There had been other nights too when Mao had left her house late at night in the same fashion. In early April, she was seen leaving her house in a hat, mask and glasses. With a phone in one hand, she walked keeping a close eye, firstly of course on the car with the FRIDAY reporter, and then the passers-by. On another night she left at about 9, without a hat this time, and wearing a white skirt. On these occasions out when she was wary of her surroundings, she will disappear under cover of night to whereabouts unknown. In the rest of the untranslated article, Friday goes on on about the rumours already covered (the ring, the deleted blog post by Kagaya Mari) and how Jun's buddies Ikuta Toma and Oguri Shun are there to always support the romance between Mao and Jun. FRIDAY editor talks about tailing Mao for 4 months round-the-clock with an 8-man team and how she is skilled at avoiding them. thank you very much for the translation. can we call this group as shun's troop? Arigatou for the translation! Kyaaaaaa, the Maotsujun ship is indeed sailing! the otp that i shipped so hard is now real. OMG!!!! I feel sorry for them and the extent they have to go through to have some measure of a normal date together. I expect it's not just because of paparazzi but the pressures of curiosity from fans as well. Glad that Mao-chan has the strength to overcome this issue and continue her friendship with Matsumoto-san despite these.